Clone and run multi accounts of a same app simultaneously and apply custom themes to cloned apps! As one of the top-ranked tool on Android, Parallel Space helps more than 40 million users log in to their multi accounts at the same time on one device by cloning! It also protects user privacy by making apps invisible on device with the Incognito Installation feature. Moreover, users are able to customize their cloned apps in Parallel Space with themes to create their own stylish launcher. So far Parallel Space has supported 24 languages. 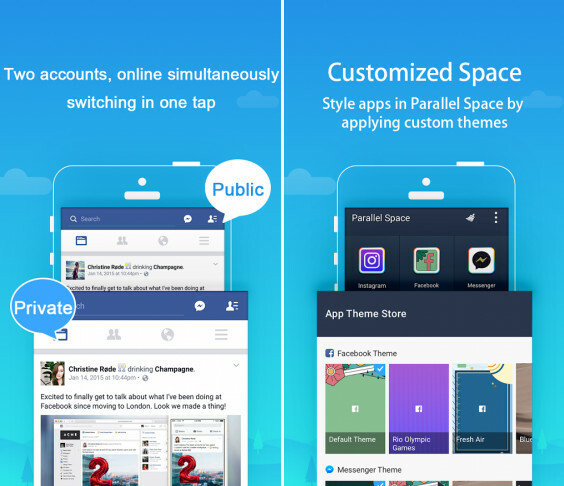 Get Parallel Space now to manage your multi accounts on one device, protect privacy and create your customized space! • Balance between users’ life and work easily. • Double users’ online gaming experience and have more fun. • Almost all apps are supported for a second account in Parallel Space. Data from both accounts won’t interfere with each other. • Hide users’ secret apps without worrying about prying eyes by keeping apps only in secret space. • Protect user privacy with a security lock. • A theme store is integrated into Parallel Space and a list of customized themes are ready for users to apply to cloned apps in Parallel Space. • Help express users’ unique identities by creating a customized space where they can style their social networking apps in Parallel Space with beautiful themes. • Run two accounts simultaneously and switch between them fast with one tap to effective manage different accounts. • Powerful, stable & easy-to-use. • Unique: Parallel Space is based on MultiDroid, the first application virtualization engine on Android. • Permissions: Parallel Space needs to apply for the permissions required by the apps added in Parallel Space to function normally. For example, if Parallel Space is not permitted to acquire your location, you will be unable to send your location to your friends in some apps that run in Parallel Space. Parallel Space does not collect your personal information to protect privacy. • Consumptions: Parallel Space itself doesn’t take up too much memory, battery and data by which are actually consumed by the apps running inside. Details can be viewed in ‘Storage’ and ‘Task Manager’, which could be found in ‘Settings’ in Parallel Space. • Notifications: Please add Parallel Space to whitelist or exceptional list of some ‘boost apps’ to ensure that notification of some social networking apps functions well. • Conflict: You cannot run two accounts of some social networking apps by using a same mobile number. You should use a different mobile number to run your second account of those apps in Parallel Space and ensure that the mobile number is active during your first login because there will be a verification message sent to this number.